In the summer of 2009 I noticed that one of the Spanish hacienda-style office buildings in the Manhattan Village Mall near my home had the first floor under construction. I didn’t think too much about it until one day there was a big banner across the front announcing “Tin Roof Bistro coming soon!” I was really excited that a new restaurant was opening so close to me. I watched construction materials come and go, and then one day it was open! Tin Roof Bistro. It had to be good. My friend, Michele, and I love to go to new restaurants and have been known to drive 50 miles to eat at a well-reviewed establishment. So I asked her if she wanted to go to TRB, and she already knew all about it. She told me that it was owned by Mike Simms, who also owns the beloved Manhattan Beach landmark, The Kettle, and the new gastropub, Simmzy’s. So we decided to try it out. Outside, we walked by grape vines and a bocce court to approach the glass front doors. Inside, the place was big, slick and pub-like with a tin ceiling, which reflected the sound of voices and dishes, making it too noisy for us. We decided to eat on the patio outside, which is in the courtyard under palm trees and has a water fountain burbling nearby. Nice and quiet, with the breeze rustling the palm fronds. Summer in California, you gotta love it. I ordered the Honey and Wine Braised Beef Panino with Cheese, and Michele ordered a Soup of the Day and Half Sandwich Special. 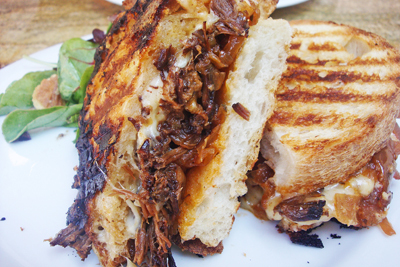 She also chose the Beef Panino, which is described on the menu as Swiss & fontina cheeses, braised beef short rib, horseradish mayo, onions, country white bread, served au jus. We waited with anticipation and finally our lunch was served. The moment of truth, when you take your first bite. Oh my god, it was outstanding. The depth and richness of a long braise, the meat simmering for hours with the onions, celery, carrots and wine. I was in heaven. A real restaurant, with a chef that knew what she was doing. Nearby. At last. Take a look at this sandwich. It’s said that brown food is hard to photograph, but my little Sony point and shoot did a great job capturing the wonderful essence of the short ribs, the melting cheese, the grilled bread. Michele’s soup of the day was Mushroom and when I had a taste, there was a definite note of sherry that was a welcome surprise. 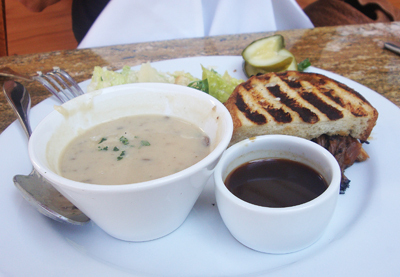 It was the mushroom soup that really intrigued me, the hint of sherry, that made me want to try to reproduce it at home. This often happens to me when I go to a restaurant – I eat something really good or new, and I want to try to cook it myself. I wanted to make my mushroom soup recipe as mushroom-y as possible, so I decided to make a mushroom stock, instead of the chicken broth listed in the recipe. I found one in Vegetarian Cooking for Everyone by Deborah Madison. It made making the mushroom soup more time consuming, but with great results. The photo at the beginning of this post is the mushroom soup I made and shared with Michelle. 1) Preheat the mushroom stock or chicken broth in a separate pan and keep warm. 2) In a large pan or Dutch oven, cook the celery and onion in the butter until starting to brown. 3) Add the sliced mushrooms, lemon juice and dry sherry and cook until the liquid evaporates and begins to form a glaze on the mushrooms. 4) Stir the flour into the mushroom mixture until incorporated. 5) Slowly add the cream to the warm stock or broth, then pour the mixture into the pan with the mushrooms. Cook over medium heat until bubbles form around the edges of the pan. Do not boil. 6) Add the tomato paste, whole cloves, thyme, garlic, parsley, basil, cognac, nutmeg and cayenne to the soup. Add salt and white pepper to taste. Simmer for 15-20 minutes. Remove the whole cloves if possible. 7) For a more hardy soup, the optional extra mushrooms can be added at this point. 8) In a separate pan, sauté the sliced crimini and button mushrooms in the butter until all the liquid has evaporated. Add the white wine and cook until they are starting to caramelize. If you are using sliced mushrooms for garnish, set aside the number of slices you will need. Cool the rest of the mushrooms briefly, then chop in a mini-chopper into small pieces. Add to the simmering soup. Adjust the salt and lemon juice if necessary. 9) Reheat to a simmer and serve. Garnish with the chives and mushrooms, or other additional garnishes. 1 ounce dried porcini mushrooms, soaked in hot water to cover for 15 minutes. 1) In a large Dutch oven, brown the onion, carrots and celery in the olive oil until starting to brown. 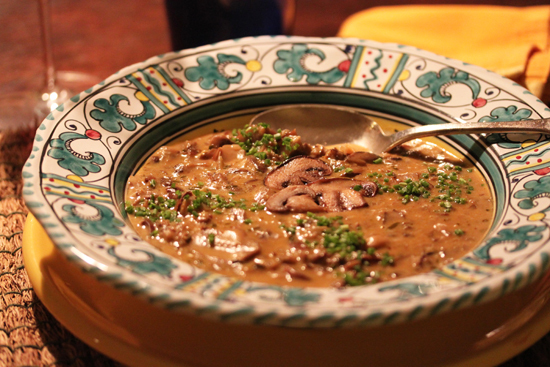 2) Add the porcini mushrooms, their soaking liquid, and the rest of the ingredients to the pot. Leave the grit in the bottom of the soaking liquid. 3) Simmer for 45 minutes. Strain through a fine mesh strainer. 4) Use immediately, or freeze in cubes or one cup measures for future use.